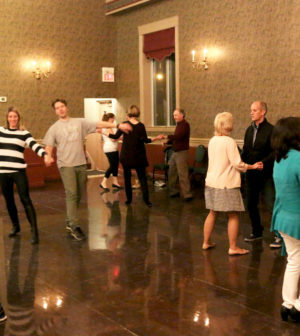 Home > eZine (local) > Monday Night Practices, 8 to 9 p.m.
Monday Night Practices, 8 to 9 p.m.
Semi-Supervised Independent Practices are available on Mondays from 8 to 9 p.m. in downtown Burlington. These are complimentary to annual flexplan holders. Other students may purchase a Practice Pass Package ($50 for 10 practices, or works out to $5.00 pp per practice), or $10 pp drop-in. An instructor is generally available for tutoring or assistance with steps. Practising helps develop the skill of lead and follow, identify different music genres, as well as learn to quickly change from one dance style to another. Please note that Practices are not available during Statutory Holidays – call 905 633-8808 or Email events@dancescape.com to confirm dates!